The VMU2108R-900 allows you to easily set up continuous monitoring when and where you need it. Without worrying about having short range Wi-Fi on the plant floor. Save $1000's in Wiring Costs - When used with a RMS900S server radio and NCA, you can reach 100's of feet across a plant floor or 1000's of feet across a plant site. Everything You Need - The VMU208R-900-SYS includes a VMU, NCA, power supplies, cables, antennas, and software. Everything necessary, except sensors,to bring vibration data to your desktop. 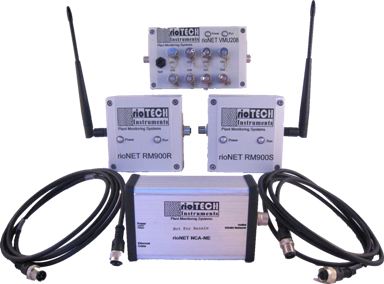 Monitor Your Entire Plant Site - Use Riotech's radio networks to continuously monitor all your plant equipment. 200 Series VMU's are more for portable monitoring while the 300 Series are designed for permanent installations.